To have a sacred place is an absolute necessity for anybody today. You must have a room or a certain hour of the day or so, where you do not know who your friends are, you don’t know what you owe anybody or what they owe you. This is a place where you can simply experience and bring forth what you are and what you might be. I was thinking about my studio and how it shapes the work I do. It’s size sets some limitations on how large I can work and I sometimes wish I had twenty foot ceilings where I could do massive canvasses. But that mild complaint does little to take away from how wonderful a space it has been in which to work on a daily basis. It is comfortable and warm with views that look out on a very private yard with mature trees, several huge rhododendrons and a constant parade of wildlife. It has room to work with a large, well appointed basement for framing and prepping my surfaces. One of the three bedrooms serves as a library and the other two hold paintings and papers. The stone fireplace that I face most of each day in my main space gives me an elemental, grounded feeling and the light that streams muted by the trees provides a coolness to play off the warmth of the space. The seclusion it offers is all I could ask for. My large front window looks out on the driveway that curves gently in and whenever I see anyone coming in, it almost feels like an affront, like an invasion into my private world. A private world that is an extension of the internal one that provides the landscapes I paint. My studio complements that inner world so well, creating a sacred space for me to hopefully bring forth what I am and what I might be, as Joseph Campbell points out in the quote at the top. It might be the one place on this earth where I feel completely at ease. Not always, but most of the time. I thought I’d share a shot today of the studio, my sacred space, in all its cluttered glory. It has come to reflect me and I, it. I don’t think many of us consider being who we are as a privilege. Too often we look to others, admiring and desiring those qualities that we see in them while downplaying our own unique traits and abilities. As a result we maintain a low profile, going along with the flow and seldom raising our voice to let our opinion be known. We allow ourselves to be made smaller. I think the subject of this painting, a 12″ by 24″ canvas called As I Live and Breathe, is about accepting who you are and having the bravery to show that to the world. Stepping forward and daring to speak your truth. There is a liberation in this simple act of understanding who you are. It sheds fears. The disappointment that often came with the realization of what you were not is replaced with the thrill of seeing who and what you truly are. We all deserve that privilege, that thrill of being who we are. This painting is included in my new show, Part of the Plan, that opens Saturday, October 29, at the Kada Gallery in Erie, PA. I will be on hand for an opening reception from 6-9 PM. For all you Cleveland Indians fans in the area: come out early so you can watch the Indians’ World Series game that night! Shakespeare said that art is a mirror held up to nature. And that’s what it is. The nature is your nature, and all of these wonderful poetic images of mythology are referring to something in you. When your mind is simply trapped by the image out there so that you never make the reference to yourself, you have misread the image. I think that the words above that Joseph Campbell spoke during his conversation with Bill Moyers for The Power of Myth speak beautifully for both mythology and art, at least in my view. I believe that we truly connect with myth and art when we see it as personal to ourselves, as being somehow symbolic of our own experience and being. Our emotions and reactions. Of course, many myths and much in art may not speak to us on this personal level. I certainly don’t expect my work to speak to everyone no matter how much I may wish that it could. It simply can’t. My work is a reflection of my journey, my limited knowledge and my flawed self. Yours is completely different. But occasionally, there is a moment when you will see something of yourself in my representation of my inner world and that to me is magical. This new painting, an 8″ by 24″ canvas, is what I see as being a very personal piece that might well reflect for others. I call it In the Inner Place and it is included in my upcoming show, Part of the Pattern, at the Principle Gallery which opens June 3. Without being specific, I see many things in this painting that I think speak strongly to how I want to see my world and my place in it. You might simply see it as a pleasant piece. Or you may see it as something reflective of your own inner world, something that speaks to who you are. I can’t say. We can’t control what anyone sees in a mirror. 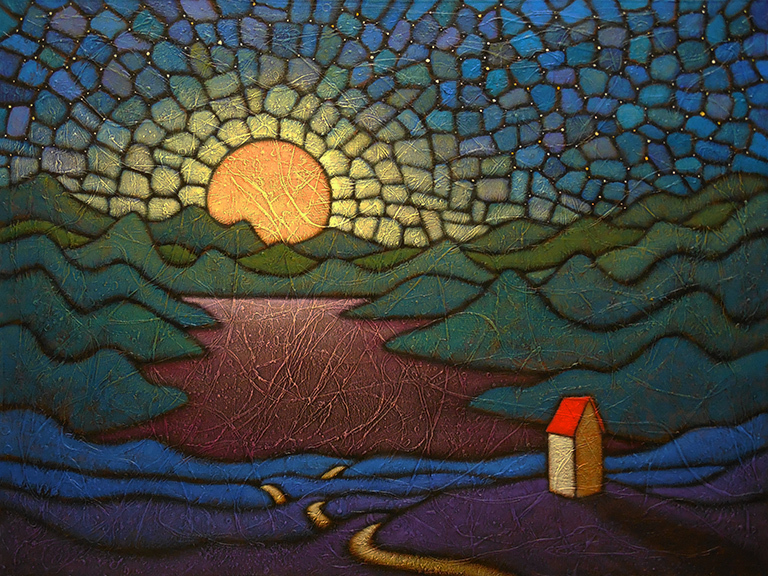 I call this new painting, which is 24″high by 8″ wide on canvas, Door to Bliss. The title refers to the well worn quote from the late mythologist Joseph Campbell, shown above, that advises us that if we work at that thing that we truly love, it will find a way to provide for us. It will find the door that moves you forward and will open it once you have fully worked your way to it. And from personal experience, I can attest to the truth behind the words. I was going to write a whole spiel about setting goals and allowing and trusting your subconscious mind to make the decisions that will ultimately lead you to those doors. But I think that simple quote and the painting itself say enough without me muddying the waters. I often use tree trunks in the foreground of either side of my paintings to act as a sort of stage curtain which further highlights the central figure. These trees also can be viewed as door frame through which the viewer is invited to pass. That’s how I saw these two trunks in this piece– as points that must be worked to and passed by before entering that desired location, that place of bliss. 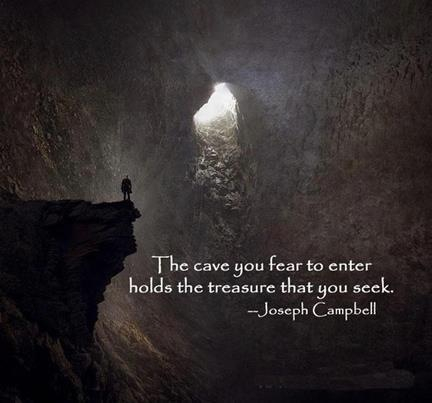 I’ve been a fan of the late mythologist Joseph Campbell for many, many years. In his many books on myth, including his classic The Hero With a Thousand Faces, as well as a great PBS series, The Power of Myth, with Bill Moyers , Campbell documented myths from around the world but more importantly showed how intimately they related to our individual lives. Campbell showed us that we all had lives that very much followed the patterns that ran through the classic myths of all cultures. In short, we are all, in our own way, heroes. We may not slay dragons or find great treasures, but we all at a point experience some form of the hero’s journey. There’s a wonderful animated short film called What Makes a Hero? from TED Ed and educator Matthew Winkler that succinctly illustrates Campbell’s premise, including the eleven stages of the hero’s journey. It’s a delightful short that will hopefully help you to begin to see the mythic elements that make up your own life. I am running a little late this morning and have a long to-do list but still wanted to have something on the blog– I guess after six plus years of doing this it has become a habit. I came across this quote from Joseph Campbell and painting, Off the Mainline, from many years ago and thought it was sharing. Plus it’s just nice to see a landscape not covered in snow and ice. But Campbell’s words, as they often do, jibe well with my own views on our journey through this life. We ultimately create ourselves and our paths and do have a choice in which direction they will take us. That’s a simple concept that is easy to overlook in the crush of life. Got to get to work. Have a great day!